• Gordon County native Matt Barton joins the state House after winning a runoff election, being thrown into session with little time for preparation. Matt Barton attended Gov. Brian Kemp's event in Dalton prior to being elected to represent District 5 in the state House. Rep. Matt Barton, who was sworn in on Feb. 12, speaks to members of an Adult Leadership Program, sponsored by the Gordon County Chamber of Commerce, during their February visit to the Capitol. "My first day they said, 'Welcome to the circus!,'" Rep. Matt Barton, R-Calhoun, said. "My second day, they said it's like drinking water from a fire hydrant." After the unexpected death of the late Rep. John Meadows, who represented Georgia's District 5, in November, a special election was called for January in order to vote in someone to represent the area. The special election saw six qualified candidates – five Republicans and one Democrat – and even during the first election on Jan. 8, no one candidate received 50 percent of the votes, pushing the race to a runoff. Barton was among the two that moved forward. On Feb. 5, voters finally chose Barton to embody them at the Capitol. and since he was sworn into the Georgia House on Feb. 12, he said it's been a learning process. Barton said when looking at other freshmen in the House, he's comforted to know he's not the only new guy. But he also said he was one of the newest faces, receiving not much time after the special election to prepare for the 2019 General Assembly, and in that way he feels he stands apart. "They know a lot more," Barton said, "but you learn fast in here." One of the other freshmen, Rep. Mitchell Scoggins, R-Cartersville, has been able to show Barton the ropes of being in the House, giving him a tour of the Capitol when Barton first joined the team of state representatives. "Obviously I got here because John Meadows passed," Barton said. "But I sure would have loved to have his guidance during this process. My respect for him has tremendously grown since I've been here." Barton said he is thankful for other representatives who have taken him under their wings, as he said "crazy" is the best word to describe what's going on in the General Assembly. As soon as it slows down it picks back up, he said after Tuesday's long session, which lasted until 6 p.m.
And he commented that more long days will follow, having heard stories from more experienced representatives and senators. "I've heard some days they'll have the doors open with people running between the two chambers, running over bills in a rush," he said. Yet despite how hectic it is to be a freshman in the state Capitol, Barton said he's had a good experience so far. Sure there's a lot to learn, he said, and it'll take a bit of time, but "both sides have been so nice to me, trying to help." He's already been able to talk to those he represents during his time in office, including speaking with a Gordon County Chamber-sponsored Adult Leadership Program that visited the Capitol last month. And Rep. Rick Jasperse, R-Jasper, said he is glad to see someone filling that seat again. Jasperse and Barton share Gordon and Murray Counties in the legislature. "I'm tickled to see someone representing the district," Jasperse said a week after Barton was sworn in. "I was fortunate I had John Meadows to help me, and I hope I'm passing on the same thing to Mr. Barton to help him." Jasperse admitted that while the first year as a representative is hard, with so many new things to learn, he has faith that Barton will do a good job representing his district. • Rain is expected to pick back up on Saturday morning and carry into Sunday. Strong storms could hit Gordon County this weekend, bringing more rain despite a week-long reprieve from the wet weather of the past several months. According to the National Weather Service's Storm Prediction Center, there is a marginal risk for severe weather in Gordon County on Saturday. The NWS forecast calls for scattered storms followed by a cold front on Saturday night. The highest risk of thunderstorms covers North Georgia on Saturday, while that risk will decline on Sunday to mainly center on Central Georgia. The storms could bring strong wind gusts and a potential for tornadoes. Also, with more rain, the potential for flash flooding and river flooding is increased. Rainfall totals for Saturday and Sunday are predicted to range from 1.5 inches to 3 inches in North Georgia. Showers are likely between 7 a.m. and 1 p.m. Saturday, with a thunderstorm possible before 7 a.m., according to the NWS. Showers are expected to continue through Saturday afternoon and into the night, with winds predicated to range from 5 mph to 10 mph. The high is forecasted to be 67 degrees with a low of 58 degrees. There is a 60 percent chance of rain during the day Saturday and an 80 percent chance at night. There is a 40 percent chance of rain Sunday, which will have a high around 68 degrees with a low around 47 degrees. The hydrologic outlook from the NWS Southeast River Forecast Center also notes that this spring will have an "above normal river flood potential" in North Georgia. "Given that spring is a characteristically active period for river flooding, this outlook indicates that north and central Georgia can expect to see the number and magnitude of river floods to be higher than typical," the outlook stated. The outlook report also noted that the last 90 days have brought "above normal rainfall" in North Georgia, with amounts ranging from 20 inches to 35 inches along and north of the Interstate 85 corridor, and even up to 40 inches in areas of North Georgia with higher elevations. House Bill 324 stirs up controversy among local sheriffs, even though state representatives say the bill is "strict" and far from being done. Catoosa County Sheriff Gary Sisk speaks at a press conference on Monday while other local sheriffs stand with him, asking why the House was rushing to pass House Bill 324. The Catoosa County Sheriff's Press Conference on Monday detailed local sheriffs' concerns with House Bill 324, which was approved by the House on Tuesday. During a press conference, several Northwest Georgia sheriffs, including Gordon County Sheriff Mitch Ralston, agreed that the Georgia House is "rushing" to pass a bill that would allow for manufacturing of cannabis for production of low-level THC oil. House representatives say the bill is far from complete. 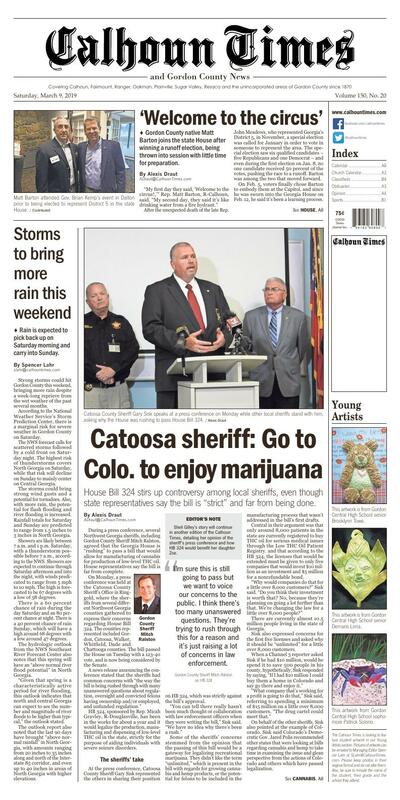 On Monday, a press conference was held at the Catoosa County Sheriff's Office in Ringgold, where the sheriffs from several different Northwest Georgia counties gathered to express their concerns regarding House Bill 324. The counties represented included Gordon, Catoosa, Walker, Whitfield, Dade and Chattooga counties. The bill passed the House on Tuesday with a 123-40 vote, and is now being considered by the Senate. A news release announcing the conference stated that the sheriffs had common concerns with "the way the bill is being rushed through with many unanswered questions about regulation, oversight and convicted felons having ownership and/or employed, and unfunded regulation." HB 324, sponsored by Rep. Micah Gravley, R-Douglasville, has been in the works for about a year and it would legalize the production, manufacturing and dispensing of low-level THC oil in the state, strictly for the purpose of aiding individuals with severe seizure disorders. At the press conference, Catoosa County Sheriff Gary Sisk represented the others in sharing their position on HB 324, which was strictly against the bill's approval. "You can tell there really hasn't been much thought or collaboration with law enforcement officers when they were writing the bill," Sisk said. "We have no idea why there's been a rush." Some of the sheriffs' concerns stemmed from the opinion that the passing of this bill would be a gateway for legalizing recreational marijuana. They didn't like the term "unlimited," which is present in the bill with regards for growing cannabis and hemp products, or the potential for felons to be included in the manufacturing process that wasn't addressed in the bill's first drafts. Central in their argument was that only around 8,000 patients in the state are currently registered to buy THC oil for serious medical issues through the Low THC Oil Patient Registry. and that according to the HB 324, the licenses that would be extended must be given to only five companies that would invest $10 million as an investment and $5 million for a nonrefundable bond. "Why would companies do that for a little over 8,000 customers?" Sisk said. "Do you think their investment is worth that? No, because they're planning on going a lot further than that. We're changing the law for a little over 8,000 people?" There are currently almost 10.5 million people living in the state of Georgia. Sisk also expressed concerns for the first five licenses and asked why it should be "unlimited" for a little over 8,000 customers. When a Channel 3 reporter asked Sisk if he had $10 million, would he spend it to save 500 people in his county, hypothetically, Sisk responded by saying, "If I had $10 million I could buy them a home in Colorado and say go there and enjoy it." "What company that's working for a profit is going to do that," Sisk said, referring to spending a minimum of $15 million on a little over 8,000 customers. "The drug cartel could meet that." On behalf of the other sheriffs, Sisk also pointed at the example of Colorado. Sisk said Colorado's Democratic Gov. Jared Polis recommended other states that were looking at bills regarding cannabis and hemp to take time in examining the issue and glean perspective from the actions of Colorado and others which have passed legalization. Another concern expressed by the sheriffs included the part of the bill that gives access to the GBI and Department of Public Health to monitor the manufacturing process, but excludes local law enforcement officers to regulate production and distributing. "There's nothing about who's going to fund the extra agents it's going to require from the GBI," Sisk said. "It always falls back to the local level. Why have they went about it the way they have to circumvent so many things that are already in place?" Gordon County Sheriff Mitch Ralston said he thought the conference went great. "I'm sure this is still going to pass but we want to voice our concerns to the public," Ralston said. "I think there's too many unanswered questions. They're trying to rush through this for a reason and it's just raising a lot of concerns in law enforcement." Ralston said he along with other sheriffs at the conference wanted to educate the public on what the passing of this bill could mean for Georgia's future. They encourage the public to contact their state representatives and senators in order to speak their mind. "Last year about this time, the Study Committee met several times throughout the summer and fall, looking at other states and studying the effects of THC oil," Rep. Rick Jasperse, R-Jasper, said when asked about the legislation. The key he thinks a lot of people forget about is that while this bill would allow growing cannabis and hemp within state limits, it's only going to be used for low-level THC oil with minute amounts of the plant. and though it's become a controversial issue among local sheriffs, Jasperse said there hasn't been a rush, that the Study Committee is giving everyone the opportunity to say what they need to say and amend the bill. In fact, during his consideration of the bill, Jasperse proposed an amendment that prohibited felons convicted on drug-related charges from participating in the manufacturing process in any way. "There are Georgians who are suffering and we're trying to take care of them," Jasperse said. "But this bill is far from being done." Jasperse said the "beauty of the legislature" is that nothing can be rushed, it just isn't possible. Everyone needs to contribute their input, amendments need to be made, and if it's still not what they want by the end of the session, they can still vote against it. He also said from what he knows, the House isn't interested in legalizing recreational marijuana in the state. While he offered a different perspective on HB 324 than the sheriffs, he said he always respects local enforcement officers who are daily on the front line of fighting drug use and trafficking. Rep. Matt Barton, R-Calhoun, said with regards to the bill, he had had many conversations with Ralston, who he knows very well. And though he hears and understands the worries of Ralston, since he's been in office for almost a month now, he does understand how much work Gravley, the bill's sponsor, has put into HB 324. Barton has seen videos of how THC oil is effective, especially for children with serious seizure disorders, and he knows Gravley has done his research to make the bill effective. "It would cost $150 a bottle, so it would be very expensive, and the bill is very strict," Barton said. "I do see a lot of positives." During his conversations with Ralston, Barton said he tried to explain the other side of the coin, yet the Gordon County sheriff was still passionately against HB 324. Barton did say that though he understands a bit more of the background behind the bill, he still did vote against it. Jasperse voted in favor of the bill. Sheli Gilley has a daughter with special needs. Before Zoe Gilley, 12, started taking cannabis oil to help with her seizures, she experienced 75-100 seizures a day, which varied in length. Zoe was also in a comatose state for about three weeks before taking the oil. After, the number is down to 10 seizures a day on average, each one lasting only seconds. Gilley, who lives in Dalton with her family, said she's read HB 324 and according to her, the sheriffs got a few things wrong at their press conference. "What they said was just not true, it was misleading. The facts are in the bill," Gilley said, who has been fighting for a bill like this for the past four years. Local sheriffs and legislators alike encourage constituents to contact elected state representatives, as well as state senators, to express their concerns, opinions and ideas. To converse with Gordon County representatives, contact Jasperse at 404-656-1753 and Barton at 404-656-0325. To contact Sen. Chuck Hufstetler, R-Rome, call his office at 404-656-0034. "There are Georgians who are suffering and we're trying to take care of them. But this bill is far from being done. "I'm sure this is still going to pass but we want to voice our concerns to the public. I think there's too many unanswered questions. They're trying to rush through this for a reason and it's just raising a lot of concerns in law enforcement. Sheli Gilley's story will continue in another edition of the Calhoun Times, detailing her opinion of the sheriff's press conference and how HB 324 would benefit her daughter Zoe. This artwork is from Gordon Central High School senior Brooklynn Towe. This artwork is from Gordon Central High School senior Demaris Lima. This artwork from Gordon Central High School sophomore Patrick Solorio.